Joe Journeyman is a wonderfully illustrated book that my son Wade loves. The images are vibrantly colored and packed full of detail. We were pulled into the adventure of Joe Journeyman and his fun friends(Ted, Franny, Polly, Carl, Ernie and Leon). If you have a child that loves to read the elves at Wrapped Up N U highly recommend this book. This book will also appeal to anybody that is a football fan too. Wade and I love playing I spy together with the book. And no matter how many times we read this book together, we always see something new. Joe Journeyman donates 10% of all net profits to support Joe’s Kids, a nonprofit pediatric rehabilitation facility in Warsaw, Indiana that serves special needs children. In addition, a portion of the profits from Joe Journeyman will also benefit local children’s hospitals throughout the country. Kids and adults who love to search can enjoy a unique story of friendship and football in a new search adventure book about the spectacular tale of Joe Journeyman, the only player to play for all 32 NFL teams. Joe Journeyman Volume 1 shares the creative, fictional story of Joe Journeyman, as he and his best friends travel from one NFL team to the next. Joe Journeyman Volume 1 is a story of friendship created and inspired by two childhood friends, author David Bazzoni and artist Jed Bruce, who reconnected by chance after 13 years. At the time, Bruce was a struggling artist who was desperate to find an opportunity to share his art. Bazzoni, president of consumer products company IDNA Brands, hired Bruce on the spot with no formal plans for what he would be doing on a daily basis. Creating Joe Journeyman has allowed Bruce to live out his dream. Joe Journeyman Volume 1 is a classic tale of good prevailing over evil brought to life through a unique blend of illustration and fine art. Each hand drawn, two-page artwork spread within this book is dedicated to one stop on Joe Journeyman’s adventure and chronicles his travels in the team’s JourneyVan with his best friends and supporters. In addition to seeking out Joe’s playbook, readers are also tasked with finding literal translations to everyday expressions that will make them laugh out loud. Readers, for example, are challenged to find “cow tipping,” which in this case is an illustration of a cow placing a dollar into a tip jar, or “leap frog,” which is a football fan leaping over a frog. There are also illustrations of city-specific landmarks, such as the “Freedom Trail” in Boston and the “Inner Harbor” in downtown Baltimore. A product for kids and benefitting kids, Joe Journeyman donates 10 percent of all net profits to support Joe’s Kids, a 501(c)(3) nonprofit pediatric rehabilitation facility in Warsaw, Ind., serving children with special needs. In addition to supporting Joe’s Kids, a portion of the profits from Joe Journeyman will also benefit local children’s hospitals throughout the country. 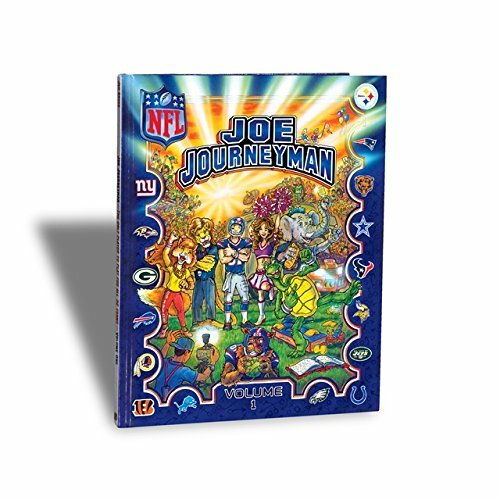 Joe Journeyman Volume 1 features 16 NFL teams, including the Chicago Bears, Cincinnati Bengals, Buffalo Bills, Indianapolis Colts, Dallas Cowboys, Philadelphia Eagles, New York Giants, New York Jets, Detroit Lions, Green Bay Packers, New England Patriots, Baltimore Ravens, Washington Redskins, Pittsburgh Steelers, Houston Texans and Minnesota Vikings. IDNA Brands will release Joe Journeyman Volume 2, featuring the second set of 16 NFL teams, in 2016. Joe Journeyman is an officially licensed product of the NFL produced by IDNA Brands, a consumer products company based out of Warsaw, Ind., most known for its flagship brand offering Sportula Products. The company also manufactures unique representations of stadiums, arenas and ballparks through its StadiumViews product line. 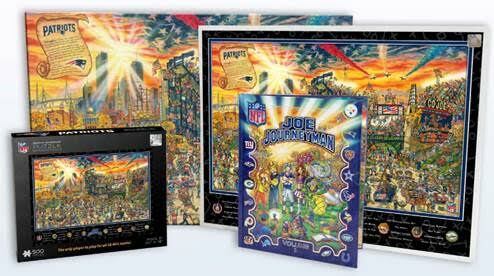 For more information and to purchase Joe Journeyman Volume 1 and related products, visit www.JoeJourneyman.com.